The concept for the musical project Blood Axis was initially created in the early 1990s by the musician, artist, and writer Michael Moynihan. He is joined in Blood Axis by ongoing artistic collaborators Robert Ferbrache a renowned musician and recording engineer, and Annabel Lee, an accomplished musician and artist. Other artists have also contributed to the project over the course of its existence. The first Blood Axis album, The Gospel of Inhumanity (1996), was recorded by Moynihan and Ferbrache in 1995 and its somber, elegant tones and conceptual richness attracted considerable attention in underground art and music scenes in Europe and the United States. 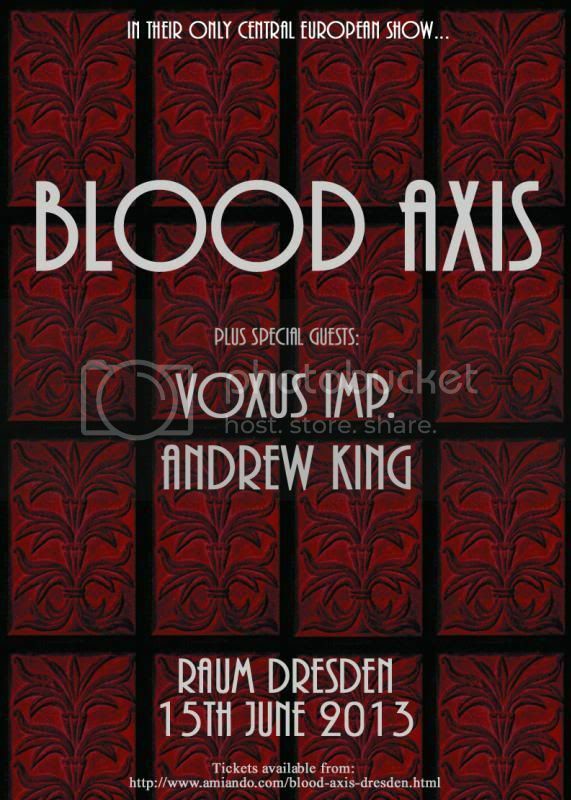 While this album continues to influence numerous bands who have imitated its sound and style, Blood Axis has long since evolved in new directions. Annabel Lee began working with the group in 1996. In 1997 Blood Axis performed at a prestigious event marking the 10th anniversary celebration of the Swedish industrial label Cold Meat Industry. The resulting recording became the basis for the 1998 album Blót: Sacrifice in Sweden, which at the time was the first release by a non-Scandinavian band on the CMI label. Blood Axis has given occasional live performances over the years. These have included sporadic events in the USA in 1992 and 1998, a European tour in 1998, special concerts in Portugal in 2001 and 2008, and a small tour of Germany and Italy in 2005. In 2010 the second full-length Blood Axis studio recording, Born Again, was released to overall acclaim. While this new album retains certain echoes of the earlier sounds of Blood Axis, it defies easy categorization and represents a bold development in many respects. In the first decade of its existence Blood Axis contributed various songs to special compilation releases; these songs will be collected together on the CD anthology Ultimacy in 2012. Hopefully they'll make it to Kyiv. They were very good in autumn 2011. And played a long show too, almost two hours! Seems there is no way to miss this. Any idea about the "special guest" ? Guests will be announced here shortly. Special guests and final flyer added. Tickets available till Wednesday 12th June. Anyone interested about going and doesn't have a ticket can PM me about the location of venue.